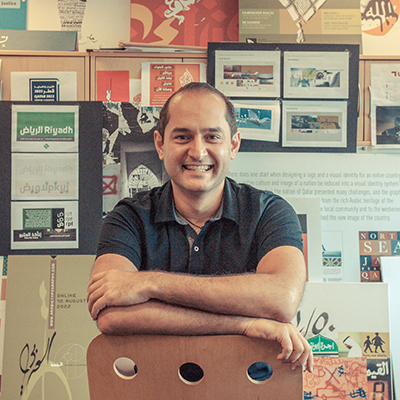 Beirut born Tarek Atrissi runs his multi-disciplinary design studio, Tarek Atrissi Design – with offices in Holland and in Barcelona – specialising in Arabic typography, design and branding. His typographic and cross cultural design approach produced projects that left a significant influence on the contemporary graphic design landscape in the Middle East. Atrissi holds an MFA in Design from the School of Visual Arts in New York; a Masters of Arts from in Interactive Multimedia from the Utrecht School of the Arts in Holland; and a postgraduate degree in Typeface Design from the type@cooper program of the Cooper Union New York. His awards includes the Adobe Design Achievement Awards, TDC, and The Dutch Design Award, among others. He lectures internationally about Arabic visual culture and has taught at the HKU in Holland; the American University in Dubai; and VCU in Qatar. Tarek Atrissi founded www.arabictypography.com, an type design foundry specialising in designing Arabic and multilingual typefaces. The foundry designed custom typefaces for major companies in the Arab world, including BBC, Apple, Riyadh Metro in Saudi Arabia, and the Museum of Arab modern art in Qatar. Atrissi holds the dual Lebanese and Dutch Citizenships. When he is not on Instagram, he is walking across the streets of different cities in the Arab world documenting its urban typographic landscape.